OK, that wasn't a hint, as much as it was the full, visible answer. BUT- if you said- ANOTHER QUILT! Then BINGO, you're right! So with no plan and no purpose, I set out to make something adorable just for the fun of it. It was new for me to not really have an end use in mind, but it felt right to break my quilting dry spell (I haven't made one since Miller's over a year and a half ago) with something just "for the love of the game". 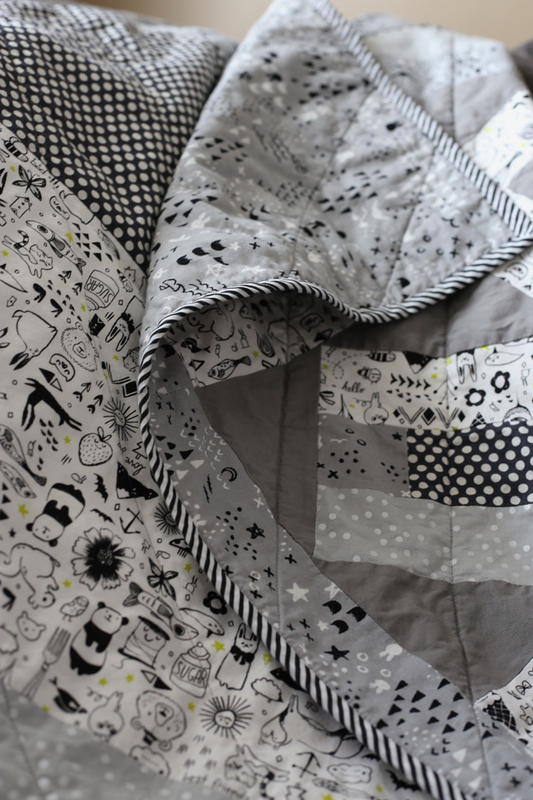 I had pinned a quilt idea a while ago, that I thought would be fun to try (where else, but the Cotton + Steel Blog?!) so I adapted that a bit to fit the fabrics I had on hand, and the size I was aiming for. (I was thinking somewhere in the 36"x48" range, so that it wouldn't take forever, or require a lot of extra yardage). Here's the big TA-DA and then I'll backtrack on the winding road it took to get there. Once I made all of my diagonal squares, I laid them out again to determine what background fabric I should use. 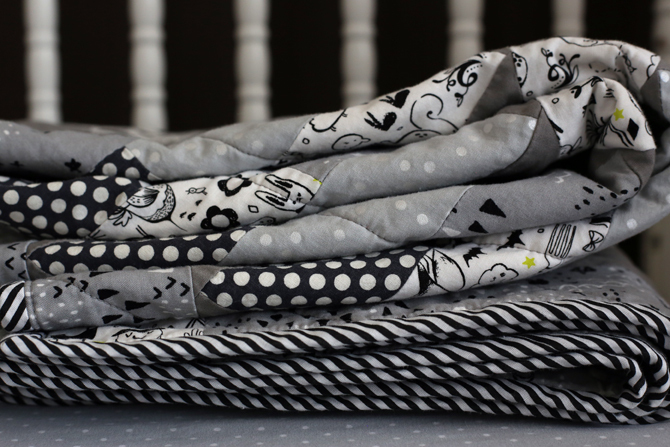 I had a few other black/white prints in my stash, but it was looking pretty busy, so in the end I just picked up a solid grey to coordinate and calm the whole thing down a bit. Once the top was all assembled, I realized there were a few areas where my squares were (way) less than perfectly square, so there are some wonky spots where the borders don't quite line up right. But short of taking some rows apart, trimming them down, and reattaching them (which is even more work than it sounds like) there wasn't much I could do, so I decided not to let it bother me (too much). 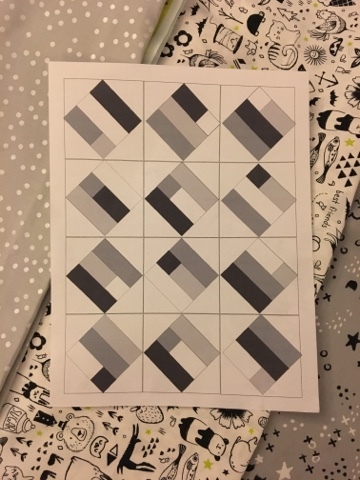 Again- I learn something each time I quilt, so perhaps the lesson on this guy was "close enough, probably" isn't the same as "actually square". I'll be more precise next time, but the good thing is, the consequences on quilts are pretty low. 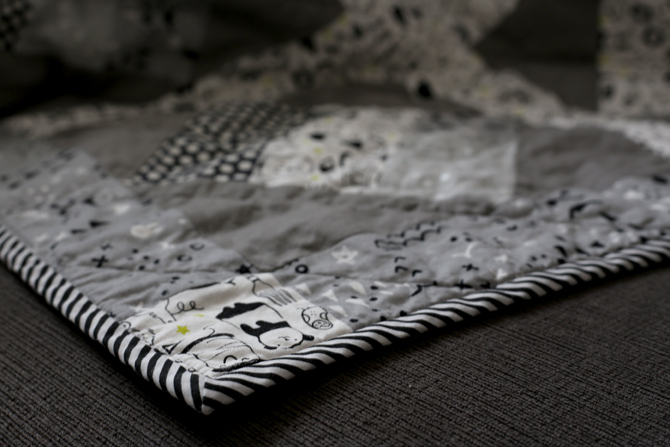 Yeah, I'll always be able to look at that part of the quilt and know I messed up, but there's also an argument to be made that it's part of the charm of a handmade project. Each quilt ends up being a bit of a time capsule of my skill level at the time, and a physical memento of my growth along the way. For the back I kept it simple. It seems most people tend to just do one plain fabric on the back of quilts...but I've always preferred to have at least some interest on the reverse side. But this one already had so much going on, that I thought doing a whole lot on the back would be overkill. I had just enough of each of the fabrics left to do big horizontal stripes, so I whipped that up lickity-split. 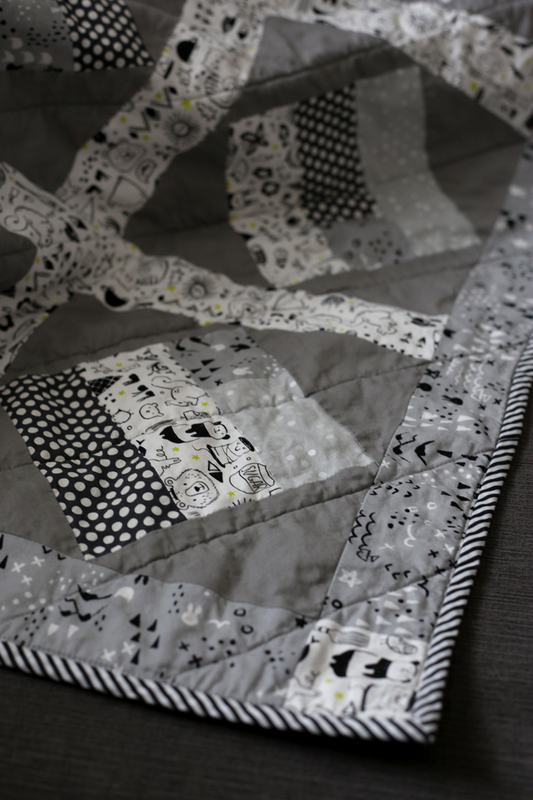 When it came time to actually quilt it, I was a little hesitant. 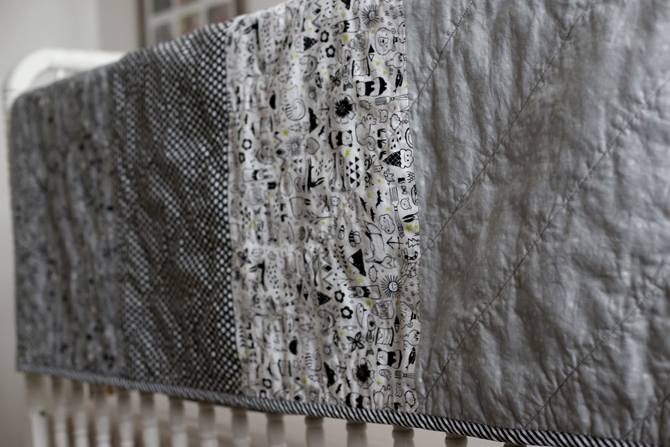 For some reason I have it in my head that quilting on a regular domestic machine is too hard, but if you believe Pinterest (which, really, you only sometimes should...) it appears people are quilting all kinds of things- even king size quilts!- on their home machines. 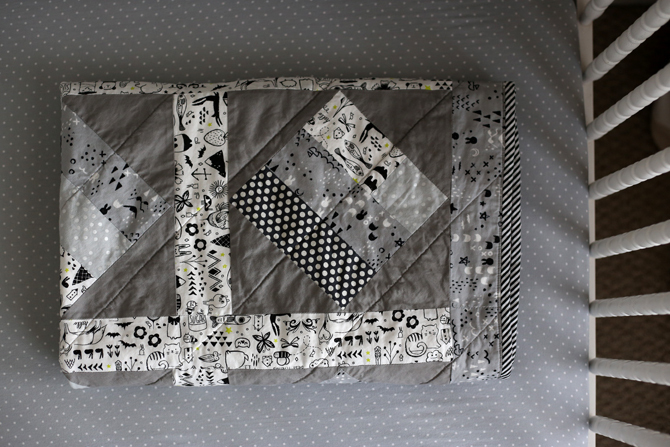 I had done two other baby sized quilts on my machine though, so I figured I could do this one too...but I wasn't sure about what type of pattern to do. 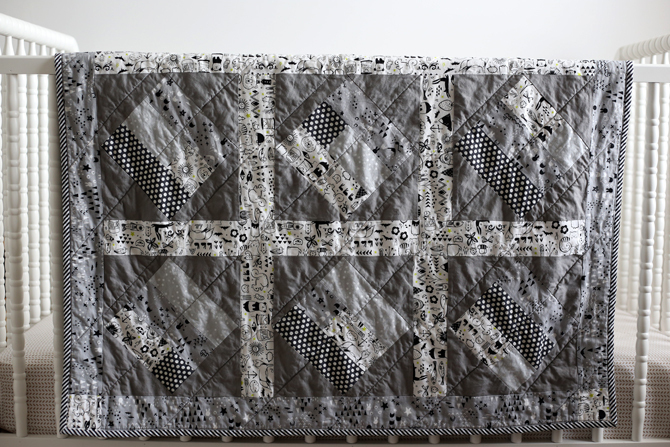 The only thing I really felt comfortable with were straight lines, but that felt like a bit of a cop out, since that's what I've done on all of my quilts (including the longarm version I did, and the ones I had sent to a professional!) Maybe I'm boring, maybe I'm scared of a risk, or maybe I just like what I like (and know what I'm capable of). In any case, I went simple again on this one- just doing diagonal lines in wide, regular intervals. 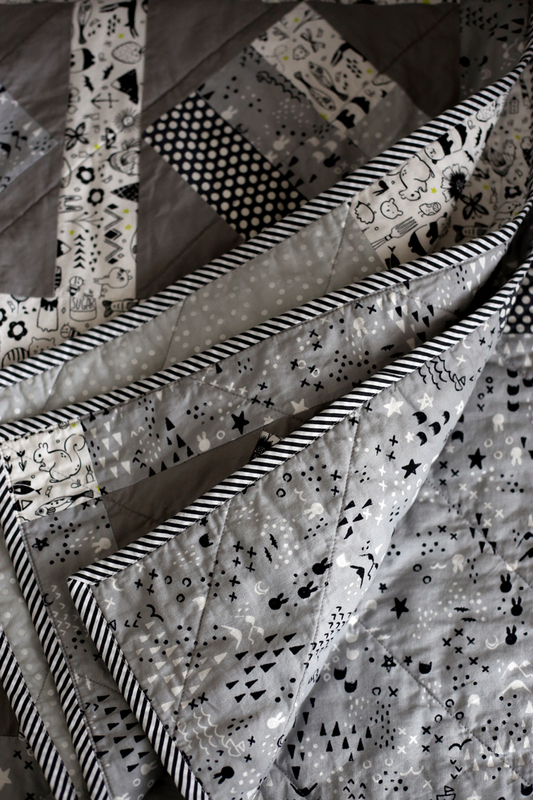 I thought I would dread the quilting part (I think the design phase is my favorite...or maybe just sewing the pre-cut pieces together) but it was actually kind of fun. I'm starting to look into more complicated techniques, and might even try free motion quilting at some point. 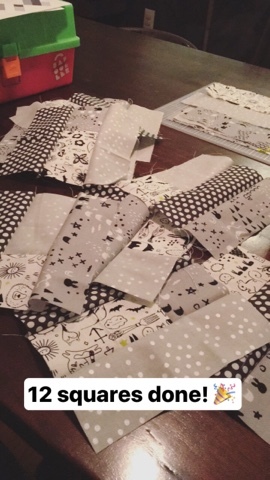 Right now I pretty much rely on what I already know about sewing, and just apply it to the world of quilting, but I think I'm probably going to have to start putting some effort into learning more "professional" quilting techniques. There's nothing wrong with being self-taught, but right now I'm more "experimental" than taught, some YouTube tutorials couldn't hurt. 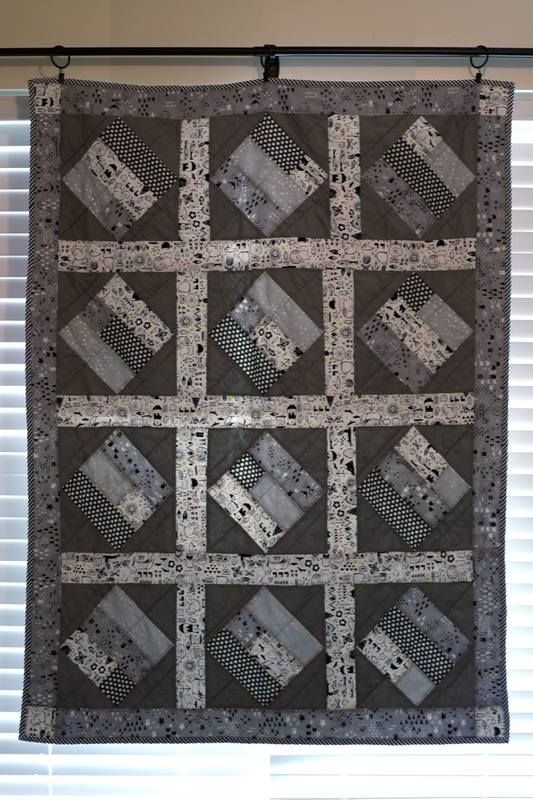 Then I popped it in the laundry to fluff/crinkle up, and voila...another Bowden quilt is complete. I still don't really have a plan for it, but that doesn't mean I don't love it. I assume we'll use it for any foster placements we may have. Or I may end up being able to part with it as a gift (Doubt it. I get pretty attached to these things...) But in the meantime, just the experience of making it was worth it for me. P.s. 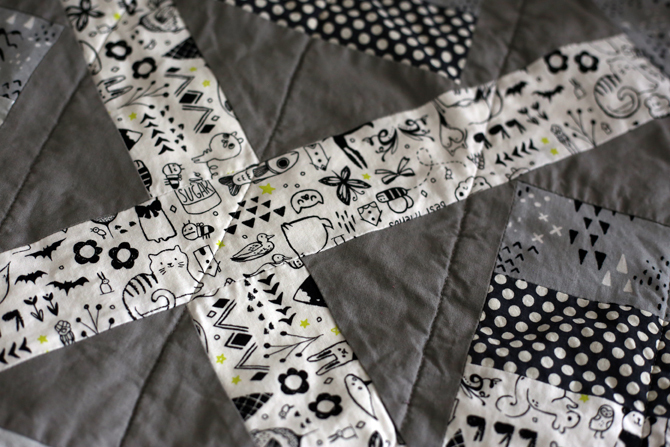 Check out more Quilty fun on the blog, or instagram.